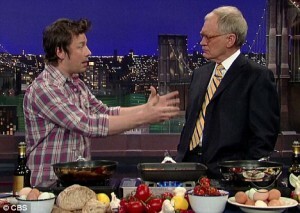 In anticipation of the debut of Jamie Oliver’s Food Revolution (Friday nights, ABC, 8 PM), the British chef conducted the usual talk-show rounds this week to drum up publicity. On Tuesday, he had his own segment — just short of seven minutes — with David Letterman. A very grouchy, stand-offish, rude, condescending, dismissive, and uninterested David Letterman. The segment immediately took a nosedive into a C-list cliff when David Letterman conjured up Kirstie Alley’s name (you know, she of “my only claim to fame for the past five years has been gaining and losing weight while raking in millions”), in the name of “demonstrating” just how hard it can be to lose weight. In light of the hard work Jamie Oliver and his team put in while visiting West Virginia to improve nutrition status, especially among schoolchildren, the Kirstie Alley reference — especially using her as a supposed benchmark or representative of American health — was most unfitting. Buried somewhere in his Debbie Downer speech, Mr. Letterman had a valid point — that unhealthy food is super-accessible and affordable in “American” culture. However, the leap from that to “diet pills are the only answer” is reductionist and leaves out a multitude of relevant factors. Letterman then went on a painfully unfunny rant about how, if weight loss is the ultimate goal, people should simply go to a doctor to get pills. I understand Letterman’s talk-show is comedy based (at least, in theory), but I don’t find smug digs, anemic hosting, or presumptuousness comical. If anything, the segment demonstrated how ignorance stifles conversation and debate. Thank you to Jenn DiSanto for informing me of Jamie’s visit to The Late Show with David Letterman. And to think I generally enjoy David Letterman & his wry humour. This definitely makes me rethink that a little. Glad to hear Jamie Oliver’s got a new show. Letterman’s just sad. Didn’t think anyone still watched him. Much can be learned from that interview. Without question, people who are living a healthy lifestyle are very much a minority. We all know that it is relatively easy to do, however, trying to “convince” the uninitiated is a difficult task. However, in Letterman’s case, one would think he’d have a “sympathetic ear” because of his heart issues. Good luck to Jamie and all the others who are on the front line. Awww that’s so sad. Jamie is just getting beat up everywhere. I just want to give him a hug because he’s so sensitive! !